On October 12, 2013, Ms. Seward was a passenger in a vehicle that over corrected and struck an overpass pillar. She played no role in causing the incident. The vehicle should have encountered a barrier that would have redirected it. Instead, it hit a mound of dirt, called an earth berm, that WSDOT installed years before. A Thurston County jury awarded a Vancouver man almost $3 million for multiple injuries caused by a pavement edge drop-off on a highway on-ramp. Todd Moothart, a 50-year-old software development engineer, was on a motorcycle ride with two friends on a beautiful Saturday afternoon in September 2013. Their plan was to head east on State Route 14 to a viewpoint overlooking the Klickitat River. When Moothart and another rider got separated from the third motorcyclist by a traffic light, Moothart decided to pull off onto the shoulder of an on-ramp for SR 14 to stop and wait for the third motorcyclist to catch up. It is safer for motorcyclists to ride together as a group because they have a more visible presence on the road. When Moothart pulled off onto the shoulder, he encountered a seven inch deep pavement edge drop-off at the fog line. A seven inch deep piece of pavement jutted out from the edge of the pavement just beyond the drop-off. When Moothart’s Harley Davidson motorcycle hit the face of the broken pavement, his front and rear wheels were severely dented, and he was launched into the air like he was on a trampoline. Safety standards in the transportation engineering field recommend that pavement edge drop-offs be kept to a depth of no greater than two inches. The Washington Department of Transportation (WSDOT) striping truck had came upon the pavement edge pothole and had painted the white fog stripe around it. In other words, WSDOT clearly acknowledging the hazard but did not report or repair it. Moothart and his passenger were both ejected from the motorcycle. Moothart suffered multiple injuries, including a kidney laceration, numerous broken ribs, collapsed lungs, pulmonary contusions, a concussion, broken bones in both forearms, amputation of the top joint of his right index finger, and fractures to bones in his right pelvic ring. He was placed on a mechanical ventilator for eight days and required several surgeries. Moothart spent 21 days in the hospital, followed by 55 days in a nursing home. He was then cared for by his mother and sister in Iowa for two months before he returned to Vancouver and resumed working part time. The design plans for the on-ramp called for an eight foot paved shoulder on the right hand side. At the location where Moothart pulled off, there was no paved shoulder at all beyond the fog line. For unknown reasons, the State’s as-built plans for the on-ramp showed an eight foot paved shoulder, but the evidence indicated that the on-ramp never had an eight-foot paved shoulder in the area where Moothart pulled off. The on-ramp was built in the mid 90’s. The Honorable Mary Sue Wilson granted judgment as a matter of law on the State’s negligence based on the State’s failure to provide an eight foot paved shoulder as required by the design plans. The jury also found that the State failed to maintain the on-ramp in a reasonably safe condition for ordinary travel. Moothart has chronic pain due to myofascial injuries and nerve damage but is able to work full time. He has ongoing disabilities related to the loss of the top joint of his right index finger, myofascial damage in his forearms, and chronic pain. He no longer rides motorcycles because the crash took the enjoyment out of riding for him. He had been a motorcycle enthusiast for over 30 years. The jury awarded $2,993,000, which included approximately $500,000 in undisputed past medical bills and wage loss. While the jury found negligence on the part of Moothart, it did not find proximate cause with regard to Moothart’s negligence. The jurors’ post-trial message to WSDOT was that it needed to develop a clear policy for identifying, reporting and promptly repairing pavement edge drop-offs so that others will not have to suffer serious injuries the way Mr. Moothart did. $1,200,000 settlement for 32 year old wife and mother driving on Alderwood Mall Parkway when a State of Washington dump truck pulled out in front of her causing her pickup truck to slam into the side of the dump truck. $1,200,000 settlement against county for unsafe road. The 2016 Wuthrich v. King County decision makes roadways in our state safer for everyone. In a unanimous decision handed down on Wuthrich, the Washington State Supreme Court held that a municipality has a duty to take reasonable steps to address overgrown roadside vegetation that makes the roadway unsafe for drivers approaching an intersection. A municipality has the overarching duty to provide reasonably safe roads and must be held to the same standards as that applied to private parties. Our state’s supreme court now explicitly rejects old law that held that a municipality’s duty is limited to mere compliance with applicable law. Moreover, an “inherently dangerous condition” does not exclusively depend on a condition that “exists in the roadway itself.” A hazard may exist as a situation along a highway, such as overgrown bushes that obstruct drivers’ view of oncoming traffic. The Wuthrich decision stems from a June 2011 lawsuit that Guy Wuthrich filed against Christa Gilland and King County. Guy was riding a motorcycle on Avondale Road NE in King County, approaching an intersection with NE 159th Street on June 20, 2008 at about 5:15 PM. Drivers on 159th St. have a stop sign at the intersection, but drivers on Avondale Road do not. Christa Gilland was driver a car on 159th Street. When she reached the intersection with Avondale Rd., she stopped to wait for passing traffic. She did not see Guy approaching from her left. She turned left onto Avondale Road and collided into Guy’s motorcycle, resulting in serious injuries to Guy. The lawsuit alleged that the County was liable for Guy’s injuries because the wall of overgrown blackberry bushes on County property obstructed Ms. Gilland’s view of traffic at the intersection. The trial court dismissed the action against the County on summary judgment. The Court of Appeals affirmed in a split decision. Stritmatter attorney argued before the Supreme Court and you may watch the oral argument here. $1,000,000 settlement for Plaintiff on bicycle struck in crosswalk in Seattle by dump truck. $2,000,000 settlement for wrongful death when vehicle slid on icy bridge with inadequate railing, and plunged into river below, drowning. $10,000,000 settlement for five family members injured (two deaths) when a tree fell on their car while traveling on SR 2. $1,100,000 settlement where long, deep rut in road on SR 12 caused Plaintiff’s motorcycle to crash, resulting in internal injuries and fractures. $4,000,000 settlement for Plaintiff on a bicycle who encountered a 2-inch vertical change between concrete sidewalk panels on the Montlake Bridge sidewalk. Defendants each blamed the other (State bridge; City sidewalk). Plaintiff suffered incomplete quadriplegia. After years of work and dedication, SKW’s team of bicycle accident attorneys secured a significant settlement for Lan Remme. Lan brought suit against the City of Seattle and the State of Washington for their failure to maintain the Montlake Bridge sidewalk in a reasonably safe condition. One sidewalk panel had been allowed to sink two inches. In April 2010, Washington State Department of Transportation (WSDOT) had photo-documented the 2 inch vertical change in the concrete sidewalk panels and called it a Priority One “tripping hazard”. Although a repair number was assigned to this problem, nothing was done. One year later, on April 2, 2011, Lan Remme rode his bicycle onto the Montlake Bridge sidewalk, traveling at about 5 mph. An eyewitness observed Lan’s front bike wheel stop abruptly as it got caught in the two (2) inch “tripping hazard,” causing Lan to pitch forward over the handlebars. Lan’s helmeted head struck the sidewalk and he laid there motionless. See below illustrations. The City of Seattle and the State of Washington settled several weeks before the trial. The City agreed to pay $2.5 million and the State agreed to pay $1.5 million. This extreme tragedy for Lan, his wife Laura and the rest of his family was preventable. His case underscores the importance of our City and State exercising diligence to ensure that the routes they invite cyclists to use are reasonably safe for bicycle travel. Van Lear vs. State of Washington, et al. $3,750,000 settlement where defendant driver pulled onto a busy intersection on SR 2 and struck Plaintiffs who were on a motorcycle. The SR 2-Flint Road intersection was unsafe because of the failure to provide a traffic light or otherwise reduce chaos at intersection. Both Plaintiffs suffered internal injuries and multiple fractures. Keith and Lisa Van Lear were severely and permanently injured at the intersection of State Route 2 and Flint Road near the Spokane Airport, the site of several crashes over the years. The State’s overarching duty is to provide the travelling public with a reasonably safe road. The State of Washington also has a duty to exercise care to correct a dangerous intersection. After years of complaints from nearby businesses, including Boeing, WSDOT chose to do nothing. Over the course of the past 20 years traffic volumes have risen and collisions have continued; but nothing has changed. Boeing had been so concerned about its employees’ safety here that it offered to pay for a traffic signal itself. Ms. L had seen no other eastbound traffic on her left. Intending to begin her left turn onto SR 2, she looked left, then right, then left again. A large truck in the outside lane with its right-turn signal activated began to slow down to turn onto Flint Road. She saw no other traffic approaching from her left, and began entering the intersection, looking now to her right at the westbound traffic that she was going to merge into. At the collision site, the Van Lears’ motorcycle and the Jeep in the background. Keith Van Lear hit his motorcycle’s brakes hard upon first seeing Ms. L’s Jeep Cherokee. He left a skid mark, re-righted his bike and then braked hard again. Despite his efforts, the front wheel of the motorcycle struck the left front wheel of the Jeep Cherokee. Keith hit the windshield A-pillar on the driver’s side with tremendous force. He was thrown to the pavement like a rag doll. Lisa was catapulted through the air and onto the asphalt road surface, where the Jeep Cherokee then ran over her. Eyewitnesses stared in horror as Lisa, trapped underneath the Jeep, was dragged across the highway. Although a traffic signal would have provided protected movement for the Jeep, enabling Ms. L to turn left on a green light without fear of being struck by through traffic on SR 2, an inexpensive alternative to a traffic signal here was a right-turn deceleration lane, funneling eastbound traffic off to the right as a prelude to the right turn onto Flint Road, and opening up Ms. L’s view of traffic approaching on her left in the two through lanes. The right-turn deceleration lane – a matter of compacted soil and asphalt – not only met WSDOT Design Manual standards, but WSDOT itself had mandated the installation of the right-turn deceleration lane here as part of the Intersection Plan it formally approved for this very location in 2002. With the right-turn deceleration lane in place, Ms. L would have seen the approaching Van Lear motorcycle and waits as it passes until it clears the intersection. See below illustration of the deceleration lane that could have prevented the horrific collision and the Van Lears’ profound injuries. Keith and Lisa sustained horrific, life-threatening injuries in the July 23, 2008 crash. Keith sustained multiple severe orthopedic and internal injuries and complications from those injuries, including a closed head injury, a severe fracture of the right arm and wrist requiring open reduction and internal fixation, a severe liver laceration, a hemothorax, a damaged spleen necessitating a splenectomy, several fractured ribs, a left middle finger dislocation, and acute kidney failure requiring dialysis to remove massive fluid buildup. As a result of the damage to his lungs, Keith developed traumatically-induced asthma. He now becomes easily fatigued just walking up a short flight of stairs. Keith remained in ICU for over four weeks after which he transferred to a full-time rehabilitation hospital in Idaho. While in ICU, he nearly died on a couple of occasions, and his doctors summoned his family and friends to say their goodbyes. Keith remained on a full-time ventilator for two months. He spent weeks in intensive rehabilitation in Idaho and then later at St. Luke’s in Spokane. He remained wholly disabled and unable to work for more than six months. Lisa Van Lear sustained a traumatic brain injury and multiple broken bones in the crash. Diagnostic imaging ordered at Sacred Heart Medical Center revealed blood in Lisa’s urine, a hemothorax, a fractured right clavicle, a fractured sternum, 10 separate rib fractures, multiple pelvic fractures, a fractured right sacrum, a fractured right acetabulum, fractures to the right L4 and L5 transverse processes, a left leg (fibular) fracture, a comminuted left foot fracture (i.e., medial navicula), an avulsion fracture of the cuboid (i.e., another foot bone) and a left wrist fracture. 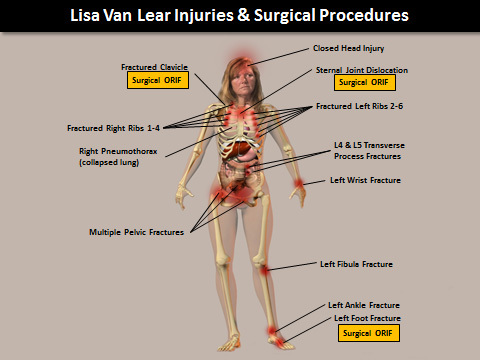 Lisa underwent multiple surgeries to stabilize her broken bones. $2,000,000 settlement with one defendant. $4,352,350 trial verdict. Defective road design and signing. Traumatic Brain Injury to 19 year old girl. Case proceeds to Trial against adverse driver and Clark County Public Utility. Settlement in additional benefits over $344,000 in Labor and Industries benefits for a firefighter injured when an unrestrained hose burst during a drill, striking Plaintiff in the legs. Total recovery was $1,044,000. $8,000,000 settlement for a defective bridge where a gap in the bridge deck was too wide, allowing a bicycle tire to wedge in the gap, throwing the rider to the ground and paralyzing him. You may have heard an interview on NPR, read a blog post, or read a story in The Seattle Times about this case. In the era of media spin and 15-second sound bites, it’s more often that we are forced to make assessments without the benefit of the facts. What apparently outraged some was the $8 million settlement. If you are interested in knowing the facts behind the story, read on. Make, remake, or confirm your opinion of what this case was about. Washington State owns the Montlake Bridge. Washington State has a duty to make all roadways safe for bicyclists in addition to cars/all motor vehicles. The roadway across the Montlake Bridge was unsafe for bicycles. The State knew this, yet chose to do nothing to make it safer. No other business or government entity was responsible for the safety of the Bridge besides the State. Since 1999, the Montlake Bridge had been unsafe for cyclists (the State repaired the hazard in 2009). Washington State started a retrofit of the Montlake Bridge in Seattle. The project included replacing the metal grate surface of the traffic lanes. The replacement grate was of a different design than the existing. The seam, formed by two abutting sections of grate, sits in the middle of the lanes of traffic. The specifications for the Bridge deck called for a narrow seam, one that would not have posed a danger to bicycle tires. The State allowed the deck seam to be wider than the specifications called for (based on tolerances), wide enough for a road bike tire to drop into it. During the deck replacement project, the State found out how dangerous the seam could be. A cyclist crashed when his front bicycle tire wedged in the seam and he was thrown to the deck face-first. Concerned about other cyclists, he contacted the City of Seattle, who contacted the State’s project manager to inspect the problem. The State’s project manager made a note about the crash in his project diary. The State’ project manager does not recall ever following up. The State could have erected a warning sign – it did not. The State could have fixed the problem – it assumed this would not happen again. The State could have closed the roadway to bicycle traffic – it did not. Mickey met up with a friend to go for a ride around the south end of Lake Washington. They intersected near UW Medical Center. It was a quiet Sunday afternoon on Montlake, not much traffic, so they traveled on the road. There was no traffic within a block’s length behind them. Mickey rode in the right lane. Halfway across the Bridge he switched to the left lane to prepare for a left turn. As he traversed the lane, he was suddenly thrown over his front bars onto the Bridge deck on his back. His front wheel had wedged into the seam in the deck. It took two people to dislodge the wheel. In comments to the multiple articles written about Mickey’s case, many were critical of his decision to ride on the roadway rather than on the sidewalk. This case settled in the months leading up to the trial date, but in pre-trial motions the court determined that Mickey had the right to ride on the roadway and that Mickey had the right to travel in the left lane because he was preparing for a turn. “[I]t is the ruling of this Court that bicycles are entitled to travel upon the Montlake Bridge roadway as a matter of law.” Judge McPhee, February 16, 2010. “Plaintiff Michael Gendler’s operation of his bicycle in the inside (left) lane of the Montlake Bridge at the time of the subject incident was authorized by law.” Judge McPhee, May 28, 2010. What does $8 million mean? It’s not winning the lottery. It’s not a windfall. The settlement amount represents the exorbitant costs of the care for someone with a spinal cord injury. To learn more about Mickey’s life as a quadriplegic, read this article. The $8 million settlement was well justified, as it will help to cover exorbitant medical bills, ongoing medical care, 24/7 assistance, facility accommodations at home and at work, etc. However, proponents of legislation to reduce the frequently target the Gendler case because of the high settlement amount. We believe that most Washingtonians recognize the importance of keeping the government accountable, when government entities ignore safety issues that could ultimately result in catastrophic injuries to innocent citizens. Settlement for a seriously injured 69 year old pedestrian hit by an automobile in a crosswalk where the warning lights were not working. Settlement for the family of an Ocean Shores Fire Department Captain who died as a result of injuries from a near-drowning during a Surf Rescue Team training on personal watercraft (PWC). Settlement for the wrongful death of a 67-year-old leaving a wife and two adult sons when he was hit in a dangerous pedestrian crossing. Settlement for a spinal cord injury that resulted in the client being a tetraplegic. Client dove into Lake Chelan in a city park and hit his head on submerged rocks. No warnings of the danger were posted, nor were "No Diving" signs. Settlement for death of a 12-year-old on a bicycle struck by a police vehicle. Settlement for a French foreign exchange student who was a pedestrian hit by a vehicle while crossing Fort Vancouver Way on her way to school. The City failed to provide proper lighting for the crossing. Settlement for death of a father of four who was a fault-free passenger in a car (highway design -- unshielded overpass column in clear zone (median)).